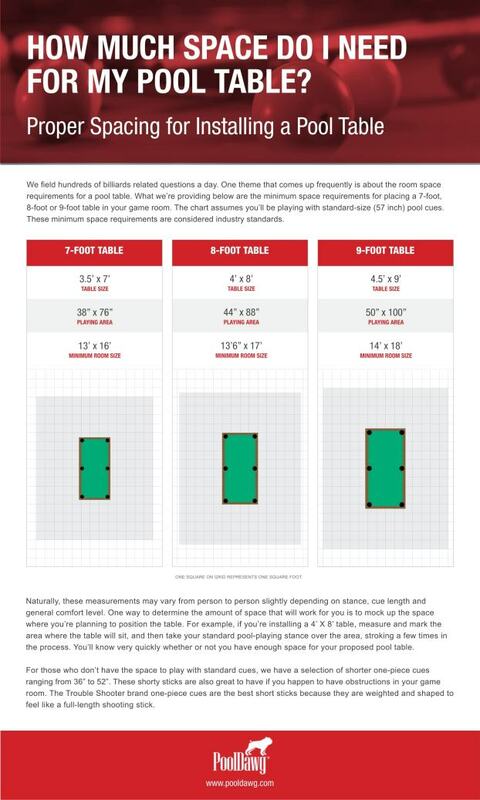 Even though we don't do much in the way of selling pool tables (we're mostly an "everything but the table" company), we do get asked what the proper spacing should be when installing a pool table. What we're providing here is the minimum space requirements for setting up a 7 foot, 8 foot and 9 foot table in your game room. We're looking at this under the assumption that you'll be playing with a regulation size (57-58" pool cue). These are considered industry standard minimum space requirements. Naturally, these measurements may vary from person to person slightly depending on stance, height and general comfort level. One way to determine the amount of space that will work for you is to mock up the space you're planning on putting the table. For example, if you're installing a 4'x8' pool table, measure and mark off the area where the table will sit and take your standard pool playing stance over the area, stroking a few times in the process. You'll very quickly know whether or not you have enough space for your proposed pool table.